Clima-Flex OA offers a new level of comfortable, cooling relief through compression and offloading for patients with mild to moderate OA knee pain. New DonJoy C-6 Fabric Technology delivers breathable, moisture-wicking comfort thats soft to the touch, antimicrobial and incorporates temperature control. Keyless offloading enables on-the-fly hinge adjustment to empower patients with convenient, comforting relief from OA knee pain. Clima-Flex OA is sleek, easy to apply and ideal for activities such as dog walking, golf, or hiking. These knee braces are also useful for the rehabilitation of patients following arthroscopic surgery performed to remove the cause of the degenerate change like and unstable meniscal tear where delay in surgery has caused degenerate change to the surface cartilage and for those of your patients who have undergone chondroplasty of the loose chondral flaps from the damaged articular surface. Off-loading knee braces that allow continued movement of the joint may be of benefit the growth of replacement fibrocartilage in the damaged area. If your patient is buying this brace they may be interested in a Black Lycra® Undergarment. DonJoy's technologically advanced design of the new OA Nano Knee Brace combines material science with innovation to create high-tech functional comfort in a lightweight design. The flexibility of the magnesium alloy frame allows for an intimate fit while the revolutionary nano MAG material provides strength to off-load and provide pain relief. OA Nano, for mild to moderate knee osteoarthritis (OA), is designed for people to stay active and move freely, making patient compliance a reality. Revolutionary in weight and profile, OA Nano offers industry-leading high-tech comfort and pain relief, ensuring that patients will choose this safe, non-invasive treatment over other options. Patients with knee osteoarthritis today have the opportunity to treat their pain and stabilize their knees with non-invasive, non-addictive treatment options. With the launch of OA Nano, the world's lightest knee brace at 14.2 ounces, OA patients can take advantage of the same technology used by the world class athletes DonJoy is known for treating. OA Nano is intended for the conservative management of mild to moderate osteoarthritis. The OA LITE is DonJoys most comfortable, lightest weight, lowest profile, patient-ready knee osteoarthritis brace and is ideally suited for activities of daily living and sedentary lifestyles. Consider this brace for the patient who is looking for an alternative to the rigid braces seen below. Your patient might want to use it when they are considering a long walk for instance as it is effective at unloading the arthritic condyle. Please check that you have measured the size needed by your patient so it is correct before you choose. These braces are a tight fit so err on the larger size if in doubt. Click on the image for instructions on how to size the knee brace for your patient and choose the correct condyle to unload (medial = inside and lateral = outside). A varus deformity (bow leg) needs a medial compartment brace. A valgus deformity (knocked knee) needs a lateral compartment brace. 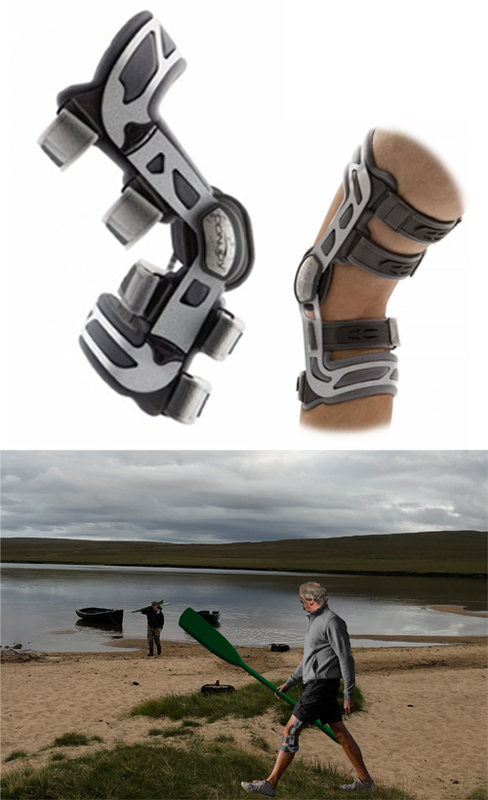 The OA Everyday knee brace is for patients seeking to regain activities of daily living with a simple bracedesign. The OA Everyday knee brace incorporates a short overall brace length with a sweeping medial thigh & calf frame to reduce the braces profile on the medial side. The patient friendly buckle release system allows for fast and easy application. It is useful for the rehabilitation of patients following arthroscopic surgery to remove the cause of the degenerate change and chondroplasty of the loose chondral flaps from the damaged articular surface. The OA Adjuster 3 knee brace is clinically proven to off-load the knee and is ideally suited to active, adult patients with moderate to severe unicompartmental osteoarthritis. 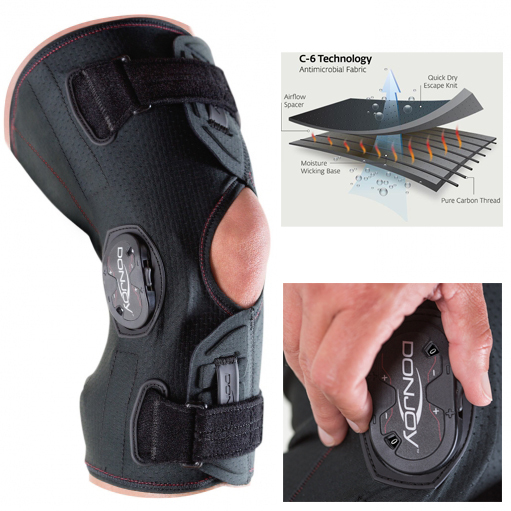 The improved OA Adjuster 3 is powered by nano MAG and reinforced with a tough aluminum frame making it the most durable and functional DonJoy OA knee brace. 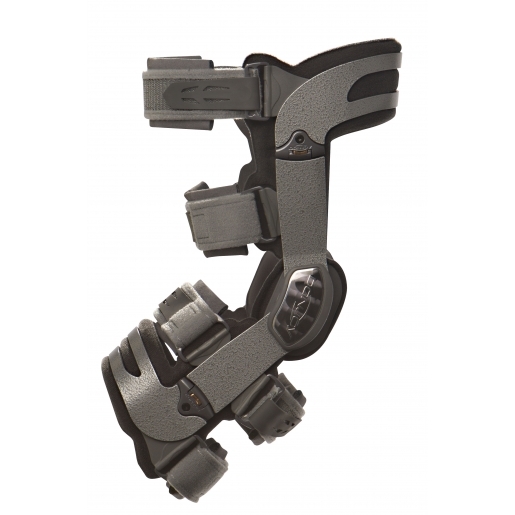 The 4-Points-of-Leverage System provides clinically proven ligament stability. Floating Hinges allow a contoured, personalized fit for all activity levels. Nano MAG Technology on the offloading side provides lightweight function with the strength of aircraft-grade aluminum. Clinically proven Adjuster technology offloads a little, or a lot. These knee braces are useful for the rehabilitation of patients following arthroscopic surgery performed to remove the cause of the degenerate change and for those of your patients who have undergone chondroplasty of the loose chondral flaps from the damaged articular surface. Off-loading knee braces that allow continued movement of the joint may be of benefit the growth of replacement fibrocartilage in the damaged area.